The 7th Brain-Computer Interface Conference which took place at Graz, Austria came to an end. The conference was organized by TU Graz during the 18th-22nd September. The newest developments in the field of BCI were presented in the conference, as well as many ideas were discussed by the participants. 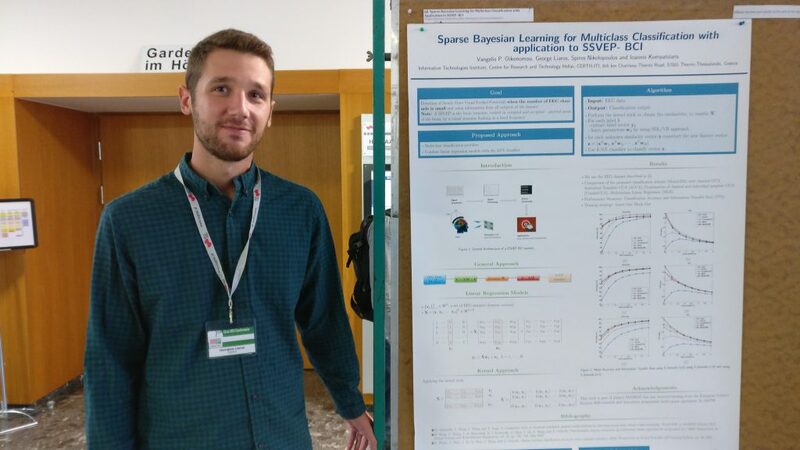 MAMEM was also there and presented its work titled “Sparse Bayesian Learning for Multiclass Classification with Application to SSVEP-BCI” which was selected for a poster presentation. its computational cost. To obtain the regression coefficients of each linear model, the Variational Bayesian framework is adopted. Extensive comparisons are carried out between the MultiLRM algorithm and several other competing methods. The experimental results demonstrate that the MultiLRM algorithm achieves better performance than the competing algorithms for SSVEP classification, especially when the number of EEG channels is small. Read NextMAMEM @ Researchers’ Night, inviting kids to play TETRIS using their eyes and mind!